John McCaffrey's latest batch of material comes in a dainty three-inch serving, a self-released affair that follows on from his contributions to the Moteer and Flau catalogues. Across seven untitled tracks in eighteen minutes McCaffrey stitches together fragments of acoustic instrumentation and cordial, homespun electronics. 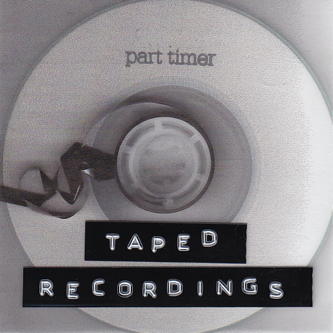 The essence of the Part Timer sound is pretty much condensed within the second and third compositions on the disc: during the former, the gentlest of steel-strung guitar pluckings entangle themselves with xylophone melodies against a quiet backdrop of watery field recordings while the latter takes on a more processed feel, but using the same sort of source instrumentation. Here clockwork, metronomic percussion ticks away at the edges of the mix whilst loops of plucked string phrases circulate, evoking that familiar Part Timer sound whilst referencing peers like The Boats and Mùm. The midsection of the EP takes us into slightly more surreal, fragmentary areas, whirring along gently as miniaturised drones, dislocated violin straggles and airy incidental sounds come to the foreground. For the final track however, McCaffrey focuses on more immediately substantial fare, stamping out a resonant, authoratative bassline while Four Tet-like up-tuned strings form melodic clusters. Taped Recordings is one of those releases that plays to the three-inch format beautifully, filling up the disc with a clever balance of curious acoustic ephemera and emotive electronics to form a small, but perfectly formed whole.